Why should you choose the Philips Sonicare ProtectiveClean 5100 electric toothbrush ? In addition to a slew of features that makes the Philips Sonicare brand a household name, the ProtectiveClean 5100 boasts of BrushSync technology that reminds you when the brush head needs replacing. So you’re assured of optimal results every time you brush. The electric toothbrush also offers 3 cleaning modes, has a pressure sensor to warn when you are applying too much force while brushing, and a long battery life. The pressure sensor prevents damage to teeth and a long battery life means you can charge your brush handle just once in several days… or even weeks. Are there any major drawbacks or problems with this electric toothbrush? As this Philips Sonicare ProtectiveClean 5100 electric toothbrush review will clearly show, there are no major problems with this model. Where to buy the Philips Sonicare ProtectiveClean 5100? Among the online retailers, Amazon offers the most competitive prices. You can also find this electric toothbrush on sale (at discounts, or with coupon codes) in physical stores near you. Are there any alternatives to Philips Sonicare ProtectiveClean 5100? The ProtectiveClean 4300 offers similar features as the ProtectiveClean 5100 , and you get a decent toothbrush for a lower price – although it may miss a few features in the 5100. 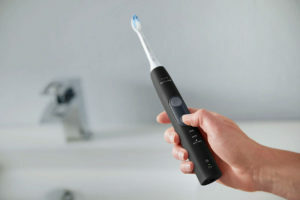 Philips has launched a line of brushes in the Sonicare ProtectiveClean series. The 5100 model sits right in the middle of this range. It offers a little more than the ProtectiveClean 4100 and little less than the top model in the series – the ProtectiveClean 6100. This series is inspired by the company’s flagship brand the DiamondClean Smart. ProtectiveClean includes several features from that series at a much more affordable price. BrushSync technology is the reason why you should go for this brush. This is advanced technology working to keep your teeth healthy. Cleans with 31,000 movements per minute. 3 modes for cleaning – clean, white and gum care. What’s to like about the Philips Sonicare ProtectiveClean 5100? It’s beautifully designed to hold comfortably when brushing. There are many different color options to choose from. The 3 cleaning modes – clean, white, and gum care – are clearly labelled on the brush handle. Choose any option while brushing by the easily accessible buttons on the handle. Two minute timer and and 30 second pacer remind you to change quadrants and brush for optimal time per quadrant. This ensures that your clean your teeth for the right amount of time and evenly. Not many of us pay attention to replace brush heads once they are worn out. With BrushSync, the Philips Sonicare ProtectiveClean 5100 reminds you it’s time to replace the brush head. Brushing too hard and damaging your gums and teeth is a real problem with some electric tooth brushes. A pressure sensor on the Philips Sonicare ProtectiveClean 5100 lets you know when you are applying too much pressure on the teeth/gums. Auto Power Off – The toothbrush automatically shuts off when the time for cleaning is over, thereby saving battery life. Exceptionally long battery life. Even though we are used to Sonicare’s long battery life, this one is a pleasant surprise. A protective travel case helps protect the brush head and keeps your brush handle safe when travelling. What’s not to like about Philips Sonicare ProtectiveClean 5100? It is slightly expensive, considering the features on offer. But the ProtectiveClean 5100 delivers an exceptional performance. Another minor drawback is that the pressure sensor could offer visible visual cues to alert the user, instead of a small LED lamp glowing dimly. You get the impression of a well-made quality product as you take the Philips Sonicare ProtectiveClean 5100 out of its box. This electric toothbrush is a step-up from Sonicare ProtectiveClean 4300 and has more features than that model. Smooth and rounded edges make it easy to hold and operate. There are no ridges or rubber grips on the handle. You can hold it comfortably while brushing. The different colored handles come in matte finish. You get to pick from white, black grey, light blue, turquoise and pastel pink. Despite the choice of attractive colors, the Sonicare 5100 does not match any of the brush heads or accessories to the colored handles. They all come in basic white. Extending the color scheme to brush heads and accessories would have been really nice. However, it doesn’t quite matter as far as performance goes. Fitting the brush head to the Philips Sonicare ProtectiveClean 5100 handle, you will notice a slight tilt in the head. This is an intentional design element. The angle of the brush head to the brush handle helps you reach the teeth at the back of your mouth with ease, resulting in a better cleaning experience and more effective plaque removal. Mid-way down the handle of the Philips Sonicare ProtectiveClean 5100 you will notice the two buttons that control major functions of the electric toothbrush. The buttons are conveniently placed below the Philips Sonicare logo and are designed to be easily accessible while brushing. The top button is used to turn your toothbrush on/off. The second button is the one that helps you select one of the 3 cleaning modes. A slight curvature of the handle helps rest your thumb while brushing. You will notice a small power symbol embossed on this part of the handle. The buttons and surroundings are designed to feel smooth to touch and comfortable to operate. A plastic panel surrounds the buttons and provides a seamless uniform look. The cleaning mode/function change button has no icon on it. You just press to change the mode of cleaning. When you press the cleaning mode button, one of LEDs lights up. The small LEDs have the modes Clean, White and Gum Care printed underneath. If you a want to select a particular mode, just keep pressing the function button until the corresponding LED lights up. You can always change the mode at any time during your brushing routine. Usually the Philips Sonicare ProtectiveClean 5100 brush handle remembers the last mode it was in when you switch it on. If you desire another mode, simply cycle through them by pressing the button repeatedly. LED lights are helpful in identifying the mode the brush is currently in. Other comparable electric toothbrushes don’t have this useful visual aid which leaves you guessing the current brushing mode of the toothbrush. Almost at the bottom of the handle there are two more LEDs with icons for BrushSync and to indicate battery level. Most toothbrush handles come with ridges or raised rubber dots to aid gripping and prevent slippage while you brush. This particular model has a smooth handle with no such markings. Is that a problem? During extensive trials with this brush, users reported no such problems. The Philips Sonicare ProtectiveClean 5100 will stay securely in your hand. On the back of the Philips Sonicare ProtectiveClean 5100, opposite to the lowest button, is a protruding part in the moulding. There is a purpose to it. That raised bit actually stops the brush from rolling away or falling off a flat surface. That is smart design thinking. The brush handle base has a small recess at the bottom. The charging stand prong fits into this recess. The brush can stand upright on a flat surface and charging also happens in this position when plugged into the recharging station. At the other end of the Philips Sonicare ProtectiveClean 5100 is a metal shaft that connects to the brush head. This metal shaft links to a tiny motor concealed inside the brush handle which also houses the rechargeable Lithium-Ion battery. The battery typically lasts around 2 weeks between a full recharge, among the longest seen among electric toothbrushes. Brush heads on the Philips Sonicare ProtectiveClean 5100 can simply be snapped on to the handle. When it’s time to change, all you need to do is to pull it off. It’s very easy and simple to do this whenever the brush heads need replacement. The Philips Sonicare 5100 comes with 2 brush heads – one for optimal gum health and the other for optimal white teeth. Note: One particular variant (white and light blue colored brush) of this series comes with only one head for optimal gum health. As you might know Sonicare has a wide range of electric toothbrush heads. The differences lie in the way bristles are positioned on the brush head. The bristles also vary in firmness, shape and height to cater to different needs. One is for polishing teeth, another is to get the spaces between teeth clean, a third is to tackle plaque, and so on. All of them still give you a good overall clean. But based upon your unique oral hygiene needs, it is best to choose a head that works optimally for you. 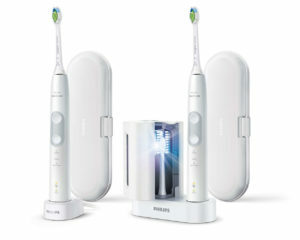 Philips Sonicare ProtectiveClean 5100 has an additional differentiator compared to other styles. It comes with the BrushSync feature which alerts you when time’s up on a particular brush head. There is a small RFID microchip embedded inside the brush head. When you pop it on to the brush handle, the toothbrush electronics start keeping track of it. On average, Sonicare recommends replacing brush heads every 3 months. If you brush two times a day for 2 minutes each time, that is total of 4 minutes per day for 90 days. When you have completed 90 x 4 minutes time worth of brushing using a particular brush head, BrushSync will alert you to this by flashing amber. It is a smart technology that adapts to your usage. If you only use the brush head for 2 minutes/day, the brush handle will alert you to replace the head only after 6 months. If you have researched/used DiamondClean Smart toothbrushes you would have seen this technology was first introduced in that series. There are also visual cues on the brush head itself. The heads have blue bristles that fade over time to turn almost see-through white in color. At this point you need to replace the head. The BrushSync chip works only with handles compatible with this technology, like the ProtectiveClean 4300, Philips Sonicare 2 Series, ProtectiveClean 5100, 6100, Philips Sonicare FlexCare and DiamondClean Smart brush handles. Of course you can still use the brush head on other handles. But the reminder system will not work on other models. 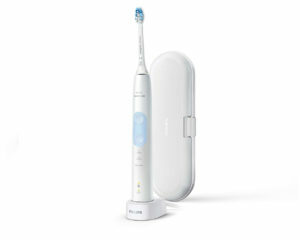 A simple press of the button turns on the Philips Sonicare ProtectiveClean 5100 electric toothbrush. As the motors starts working, so does the timer on it. Now as you brush using say the standard clean mode, the timer keeps track and automatically turns off at the end of 2 minutes. So you don’t have to keep track or set the timer. This is done for you automatically. Why the 2 minute time limit? This is what most dentists recommend as cleaning time for optimum oral health. If you are using the White Mode, the brush head runs for 2 minutes and 30 seconds. If you are using it in the Gum Care mode, then it will run for 3 minutes. At the end of these time frames, the brush handle will automatically turn off. After every 30 seconds the brush motor of the Philips Sonicare ProtectiveClean 5100 pauses briefly. You will notice that the cleaning action stops and so does the humming noise and vibrations on the handle. This brief pause is to alert you to change your brushing quadrant. This is called the QuadraPacer. What is the brushing quadrant? What is the QuadraPacer? For effective cleaning, imagine dividing your mouth into 4 quadrants – upper right, upper left, lower right and lower left. You devote 30 seconds of cleaning time for each of the 4 quadrants. Your electric toothbrush will experience a brief pause and restart again at each 30 seconds intervals, thanks to the QuadPacer. This ensures that you clean your teeth and gums evenly in the recommended 2 minutes. This feature is an excellent addition. When in the White or Gum Care mode the pacer works only for the first 2 minutes. After that, in White mode, you have to focus on front teeth and in the Gum Care mode you will focus on the gums. That electric toothbrushes are way superior to normal toothbrushes is proved beyond doubt. However, better cleaning is achieved only when the electric toothbrush is used the right way. A word of caution here: Do not run the brush back and forth on your teeth. Just move it from tooth to tooth. The cleaning is done by the bristles with the aid of the motor. Another point is to hold the brush head at a 45 degree angle to your teeth. When reviewers put the Philips Sonicare ProtectiveClean 5100 through different modes, they were impressed by its performance and the results. Teeth cleaning was fantastic and it was easy to use too. All three modes in the Philips Sonicare ProtectiveClean 5100 are efficient and effective. The standard mode is Clean which runs for 2 minutes, giving your teeth a complete and thorough cleanse. Every 30 seconds the brush stops briefly so you can move to the next quadrant in your mouth. If you want to switch to one of the other two modes, just press the function button until the LED corresponding to the desired mode glows. In White mode, which lasts 2 minutes 30 seconds, after the first 2 minutes of clean mode, the brush runs for a further 30 seconds during which you use the brush in front of your mouth to polish your front teeth. In Gum Care mode, the electric toothbrush runs for 3 minutes.The first 2 minutes are for cleaning and the last minute is for massaging, cleaning and stimulating the gums. We often forget that gums need to be healthy too. Sonicare has taken care of that aspect very nicely. With manual brushing, you cannot generate the number of brush movements that an electric toothbrush like Philips Sonicare ProtectiveClean 5100 electric toothbrush can generate. It generates an impressive 31,000 movements per minute. All plaque buildup or debris hiding between teeth gets dislodged and forced out of your mouth. In gum care mode, the brush is gentler, with softer motion at lower power. If you have sensitive teeth or gum disease, then brushing on gum care mode offers a less aggressive cleaning option. It allows cleaning without too much vibration or pressure on already fragile teeth and gums. If you want to choose between different intensity levels in all modes of cleaning, however, go for the Philips Sonicare ProtectiveClean 6100. The bristles of your electric toothbrush need to only touch the surface of your teeth and gums to effectively remove food debris, bacteria and plaque. 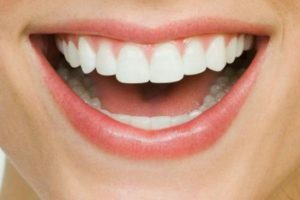 There is no need to apply force or too much pressure on the teeth or the space in between them. Sonic vibrations of the toothbrush itself will dislodge it from your teeth and gums. Brushing too hard might cause your gums to recede and may also damage tooth enamel. Also brush heads will wear out quickly. So try to not to apply pressure while brushing and run the electric toothbrush lightly over your teeth. In case you unknowingly apply excessive pressure while brushing, the built in sensor alerts you. The handle will vibrate to let you know that you’re applying too much force on the teeth. In addition, the LED light flashes amber to alert you. Once you reduce the force applied, the vibrations will stop. This is a useful feature to have on the Philips Sonicare ProtectiveClean 5100 . Though the visual cue is not as large and visible as with the DiamondClean Smart toothbrush it is still easy to know when too much force is being applied. Many long-term users of electric toothbrushes are aware of how much pressure to use while brushing. Over a few uses, you will soon learn to spot these signals. The sensors and signals are more helpful for first time users. Not everyone is comfortable brushing with a electric toothbrush. It takes time and bit of learning. To make this transition a little easier the EasyStart feature helps users of the Philips Sonicare ProtectiveClean 5100 to get used to the power of their new toothbrush through a gentle start. Over the course of the first 14 times you use the brush, power is gradually increased so that you’ll become adjusted to the vibrations and movements of the brush head. These sensations can be jarring to a first time electric toothbrush user if applied at full force. This is good idea from Sonicare to ease new users into electric toothbrush routine without the initial shock. For the first timers the discomfort of 31,000 movements per minute might even discourage regular use. By gradually easing you into this with EasyStart, the transition becomes easier. People who already use electric toothbrushes can skip right to the full power mode and sidestep EasyStart. The Philips Sonicare 5100 electric toothbrush is reasonably waterproof. Accidental exposure to toothpaste, saliva or sprayed water will not damage it. But you cannot use the toothbrush in the bath or while showering. It is NOT designed to be dunked in water. So don’t immerse in a bathtub or sink. Just a quick wipe with a damp cloth to remove any dirt or stains should do for keeping the device clean. A robust, strong travel case comes along with the Philips Sonicare ProtectiveClean 5100. It can hold the toothbrush handle and upto 2 additional brush heads. This is convenient to carry your electric toothbrush while traveling. Most of the packaging is environmental friendly. To sum up, the Philips Sonicare ProtectiveClean 5100 is a great electric toothbrush that helps to clean your teeth and keep them healthy. It comes in several attractive colors. The handle is slim and pretty comfortable to hold while brushing. The brush offers 3 modes of cleaning – Clean, White and Gum Care. LED lights on the handle indicate the mode. For first time electric toothbrush users the EasyStart program lets you gently ease into the brushing. Pressure sensors alert against using too much pressure which might damage tooth enamel and gums. A built in timer and Quad pacer automatically give you cues to switch sides while brushing. It also turns the motor off once two minutes are up. The 2 week long battery life after a full recharge, and a water resistant handle are additional bonuses. You can switch at will to a different brush head as the Philips Sonicare ProtectiveClean 5100 is compatible with many other brush head models. 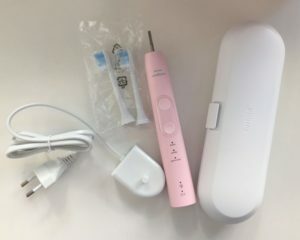 The Philips Sonicare ProtectiveClean 5100 comes with a Lithium-Ion battery and the manufacturer’s information brochure says that it’s good for 2 weeks of usage following a full charge. In trials using the most power-hungry mode (Gum Care), the battery ran for 3 weeks. In the Clean mode which consumes least power, the battery ran for 5 weeks and allowed for 75 brushing sessions. flashing amber with 5 beeps means you need to charge or there is no brushing sessions left. Charge the brush handle by propping it on the stand. A prong on the stand fits into the bottom of the brush handle. When you switch on the charger, it will give out 2 beeps indicating recharging is happening and that you have correctly placed it on the stand. The Philips Sonicare ProtectiveClean 5100 brush handle takes around 24 hours to charge fully. Once the toothbrush is fully charged, the battery’s green light turns on for 30 seconds and then it automatically switches off. The toothbrush supports 100-240v, and you don’t need a voltage adapter, only a suitable plug adaptor while traveling. The charging stand is wired into a 2 pin power adapter. If your bathroom doesn’t have a 2 pin socket you could simply buy an adapter to plug it in. It’s okay to leave the brush on the stand when not in use. If you prefer to, you can charge it even when the battery is half-full. But it is good practice to let it run down before fully charging as it keeps the battery in good health and lasting longer. Sonicare claims that its battery, made using Lithium-Ion technology for the Philips Sonicare ProtectiveClean 5100, will last approximately 2 weeks before needing to be recharged. In actual tests, it lasted much longer than that. In fact in the cleaning mode many people have used it almost for 5 weeks without having to recharge. On its highest power mode, a single charge lasted for 20 days. Full battery is indicated by solid green light, while other stages of battery are indicated by flashing green. A flashing amber light with 3-5 beeps indicates that the battery needs recharging. It takes one full day to charge. The device works from 100-240v. Of all online marketplaces , Amazon usually offers most competitive rates as well as periodic discounts and deals that get you an even better price. But there are also many other retailers, both online and offline, from whom you can purchase this electric toothbrush. Several reviewers have tested the Philips Sonicare ProtectiveClean 5100 in a normal bathroom environment. 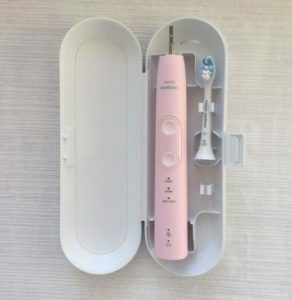 Everyone is impressed by the high quality finish of the product, the attention to detail in design and the general look and feel of this high quality electric toothbrush. Being an electronic product that’s used in a damp environment, it is prone to malfunction in a few cases. But the 2 year warranty ensures that you’ll get a replacement if such an unfortunate event ever happens. The Philips Sonicare ProtectiveClean 5100 is a quality product. It is a great ‘value for money’ kind of tooth brush. It has several excellent features which make the model worth the extra price. The different cleaning modes, with differing speeds and power, make it suitable for folks with different oral health needs. The Sonicare 5100 offers rock-solid performance and is comfortable to use even for first-time buyers. In the long-term, this is an excellent electric toothbrush for most users.